Megastar Amitabh Bachchan received the third Hridaynath Mangeshkar award for his contribution to the film industry. 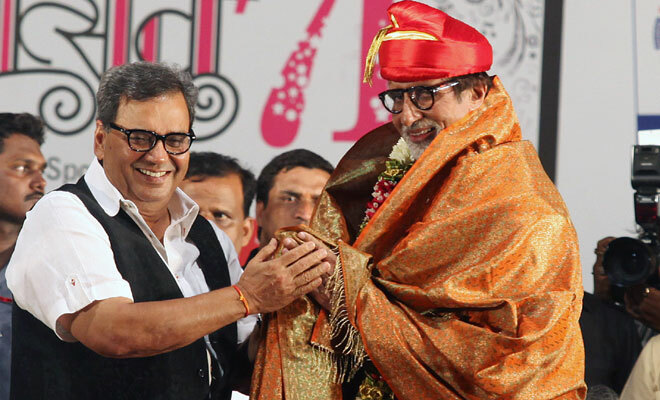 The prestigious Hridaynath Mangeshkar award was supposed to be presented by melody queen Lata Mangeshkar to Bachchan, but due to health issues she could not make it and filmmaker Subhash Ghai did the honours. “I got everything in life from Mumbai, my success, my stardom, my wife, my children and now even grandchildren. I am truly proud to be a Mumbaikar as the city has given me the most,” Bachchan said after receiving the award. He was full of praises for Lata Mangeshkar at the ceremony and even promised to speak in her mother tongue (Marathi) the next time around. “Lataji has been exceptionally kind to us even in past when she sang for Jaya. Sadly she couldn’t make it to today’s function due to her illness, yet she apologised which is too humble on her part and status. I am truly honoured by this award,” he said. The award function was followed by ‘Hridayotsava 71’ music concert, which was a musical tribute to Bachchan and Mangeshkar, with some of the best yesteryears hit numbers sung by Shaan, Sunidhi Chauhan, Sudesh Bhosale, Mahalaxmi, Sadhana Sargam and many others. The Mangeshkar family has been observing Pt Hridaynath’s birthday for last 24 years and the first award was bagged by Lata Mangeshkar in 2011. Her younger Asha Bhosle was honoured with the same award last year.